Please provide information on the Veteran who served with the 320th. If the Veteran has passed, and their next of kin is entering this information, please ensure to note the death date in the comments section. If we are unable to reach you, who may we contact as your next of kin? Or, if the Veteran's next of kin is the one entering the information in the form, please fill out your contact information here. All Service related information is optional, however the more information you provide allows us to have a more robust database of information. 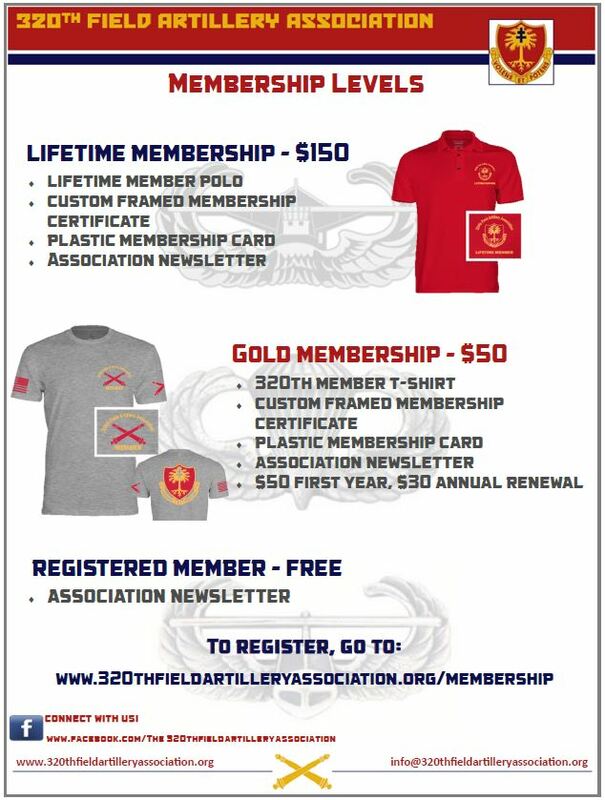 We accept into membership anyone that has ever served in the 320th FA from 1917 (WW1) to today's 101st troops at Ft Campbell, KY and those deployed. We also offer membership to close relatives of those who served. Paid memberships are optional. If you have selected a paid membership above, please fill out the information below so we can fulfill your membership package.